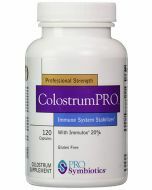 ColostrumPRO 120 caps Pro Symbioticsis an Immune System Stabilizer With Immulox 20% that is Gluten Free. ColostrumPRO with Immulox enhances normal immune factors, providing dual action – in the bloodstream and in the digestive tract, to help maintain a robust intestinal lining and promote healthy intestinal flora. ProSymbiotics ColostrumPRO is Professional Strength that contains Immulox. 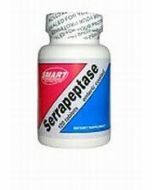 This standardized supplement offers a high potency proprietary complex consisting of Lactoferrin, Immunoglobulins, Proline-Rich Polypeptides (PRPs) and Immulox. The amount of Immulox found in all PRO Symbiotics products is double the amount offered in the regular Symbiotics. Immulox is Colostrum standardized to contribute a higher concentration of PRPs. PRPs are signaling proteins with amazing adaptability for immune modulation, considered to be the most important constituent in colostrum. Minimum levels of these components are verified by laboratory testing.